Handmade from repurposed mail sacks, this sturdy, canvas tote delivers style to your day-to-day. Neither rain, nor sleet, nor gloom of night shall keep you from carrying it all to wherever your travels may take you. 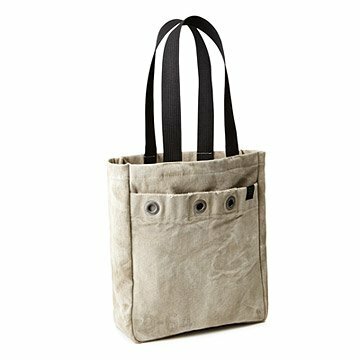 Handmade from repurposed mail sacks, this sturdy, canvas tote delivers edgy style. Weathered stamps that read "U.S. mail" run across the tote’s front, and a grommet-decked back pocket provides an accessible spot to clip and stow keys, electronics, your wallet, and more must-haves on your route. Made in Mexico. Due to the upcycled nature of the materials the rivets, graphics and worn look of these accessories may vary. Distressing, light fraying, and patch marks (all gathered through years of postal use) add character to this one-of-a-kind bag. Each tote will feature varied block printing from the original sack. Take a studio tour to see where the Upcycled USPS Mail Sack goods are designed. My job requires that I travel between buildings/sites so I use this to carry my materials and laptop. I read the reviews about the quality of this bag being spotty, but chose to ignore them. What I got was a filthy, grimy bag with holes that had no organization to it. Am returning it. Perfect size for my "take to work" items without being too stuffy or controlled. I need a fun bag for a stress-filled job! Looks like it can handle the job! The bag is exactly what it said it is. It's very sturdy and a great reuse of materials. But as the description notes, it is not the same as the one pictured. The one in the pic seems trendy and cool, but the one I received has a bit of fraying at the top and is a bit more stained than the one pictured. Don't get me wrong, I like it, but it's just not the conversation piece I thought it would be. Thought about this unique bag for awhile and finally purchased it as a selfie birthday present! Have been so pleased with it since. Love the idea of repurposing products in a far too disposable world. I carry this everyday as my work bag. It holds my IPad and books and lunch bag too. The straps are a great length and once you have main compartment full you don't have any problems with pocket gaping. I love that it is up cycled . By far, my favourite purchase from this awesome co. This is a nice everyday tote. It does fit on my shoulder, but I wish the straps were just a few inches longer. The front pouch seems to hang open a bit, but as stuff is added to the inside, the outside pouch seems 'sturdier'. I may sew on a piece of Velcro to help hold it tighter. I've even thought about some kind of tie through the metal rings to keep the top of the bag closed - using a material similar to the black straps. Overall, I like my mailsack bag. Even better than what I expected! This bag is even better than what I had expected! I read the comments and knew that the pocket was too big and loose, so I just used a safety pin as someone else suggested - it worked out perfectly! Thanks for a great product that carries history and tells a cool story! I found the perfect bag! I wanted a bag that I could take to work and travel with. I just throw in my wallet, sunglasses, lunch and ipad...and off I go. I love this bag because I dont have to be worried about it showing dirt and will take the wear and tear that I will put it through. Outside pocket a little too open/short; can't be sure things wouldn't fall out. Otherwise LOVE this bag. Sturdy and cool.